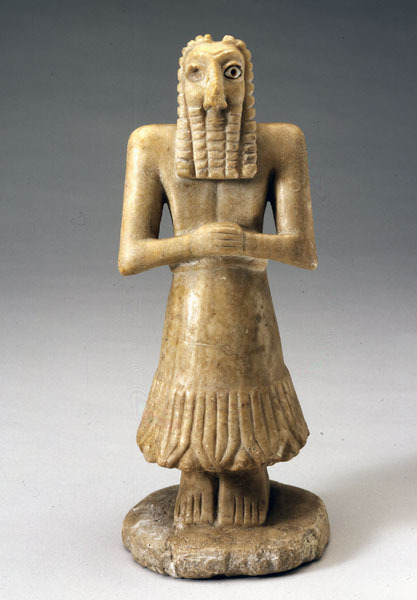 Statuette of a Man, about 3000-2500 B.C. In the early third millennium B.C. the Sumerians lived in independent city-states on the vast, fertile plains of Mesopotamia between the Tigris and Euphrates rivers. The focal point of their settlements was the temple, the god's earthly residence and the city's economic center. Found beneath the floor of a temple at Khafaje, northeast of Baghdad, this imposing statuette of a bearded man stands in a posture of austere piety. His carefully patterned beard and fringed skirt identify him as either a high priest or a god. Typical of such votive statues, the figure is highly stylized with little reflection of musculature or naturalistic proportions, its head expressing devotion and power through the exaggeration of facial features. Enlarged, staring eyes made of shell inlaid in bitumen project a concentrated intensity, which is accentuated by crescent-shaped brows. Squared arms and tightly clasped hands add to the figure's strength.